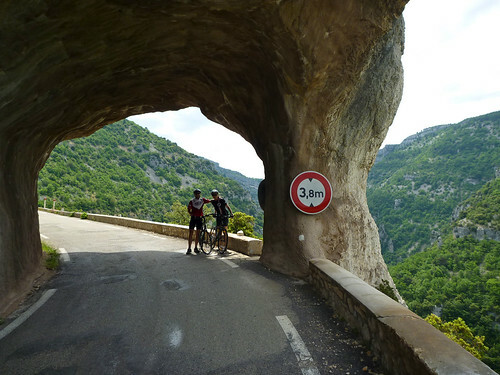 Les Gorges de la Nesque is a stunning route starting in Villes-sur-Auzon just 10 kms from Bédoin – the start of Mont Ventoux. The route is 20 kms long, averaging just 2% – so it’s not hard. But so beautiful. It’s the perfect route for someone that wants the enjoyment of riding along fun cliff roads, but for whatever reason isn’t able to do a tough alpine climb. 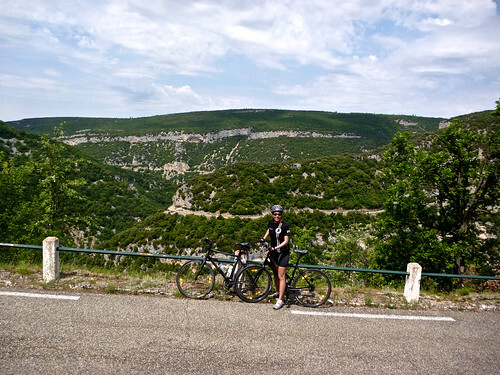 After Saturday’s Ventoux cyclosportive for me – and an ascension of Ventoux from Bédoin by Doreen (!!) – this was a dream Sunday “rest-day” route. Les Routes du Ventoux cyclosportive (Sept. 12, 2010) descends through Gorges de la Nesque at the very end of the race. I rode this in 2008, details here. Stop it Will, just stop it…….making work even harder here in good ol blighty! Seriously, keep up the good work!